For fans of women's rugby "Scrum Queens" is the only place to go. And founder Ali Donnelly's hard work has now been recognised with the site's short-listing as a media game-changer in the UK. Even more impressive when you see the competition; BBC Sport, Sky Sport, The Telegraph, BT Sport and First News. So no pressure there then. Watching women's rugby can be a frustrating experience as unless you're physically at the game finding it on television can be almost impossible. Online streaming by the national federations is the next best step but most of the time I just follow Scrum Queens's tweets on @ScrumQueens for the latest scores. They're the only single sport organisation listed, and the only website. Plus of course the only ones run by volunteers. 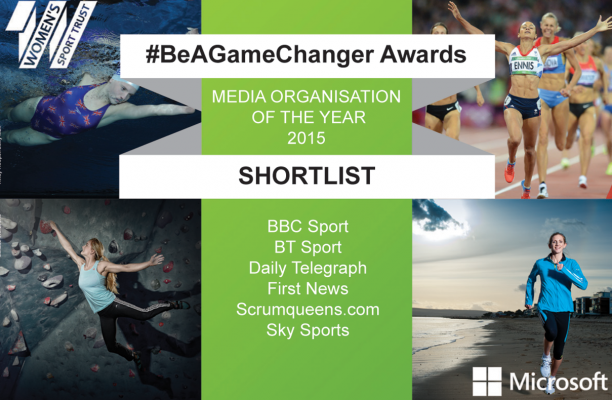 "The Women’s Sport Trust #BeAGameChanger Awards recognise those individuals and organisations doing the most to progress women’s sport. The shortlist of six will be whittled down to three by the judges later this month before those final three go forward for a public vote to be named winners. Public voting on this and other categories opens on April 7th 2015. Details on The Women's Sport Trust.